Visit our warehouse or our showroom discount appliance store in St. Louis. While the big box stores may offer cheap refrigerators or low-end machines at a discount to draw customers in, we offer high-end products at a discount of 20% to 50%. At our 2 locations, St. Charles and Maryland Heights, you will find hundreds of models on display, and the selection changes constantly as new appliances arrive by the truckload. If you don't see the one you're looking for, let us know and we can help you find what you need - it could arrive any time. Check with us often as we receive limited quantities of each model. You always save on name-brand premium products at St. Louis Appliance Outlet. 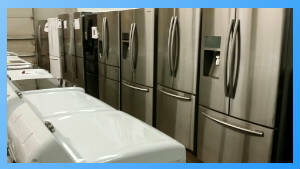 We buy discount appliances that are discontinued models, open-box, returns or overstocks. All are new, but with damaged crates or boxes and sometimes cosmetic damage, at substantial markdown from manufacturers like Samsung, GE, Whirlpool, LG, Maytag, and Kenmore. Once we purchase the appliance, we quality inspect the product to verify condition. We offer these cheap new appliances to our customers for steeply reduced prices, with discounts of 20-50% of the retail prices. We are an official outlet for new scratch and dent appliances in St. Louis. "Scratch and dent" is a term used to describe appliances that have cosmetic imperfections but the function of the product is not compromised. We carry discount appliances that are considered scratch and dent because they may have visible cosmetic damage that does not affect the performance of the machine. Most of our scratch and dent inventory has very minor and often undetectable damage. In addition to our selection of discounted new appliances, we also offer a great selection of used appliances. You may want to buy used appliances to save a lot of money. These appliances are offered at very low prices and they have all passed our inspection to ensure you get great performance for the life of the product. We have two convenient locations to serve the Saint Louis Metro area: Saint Charles and Maryland Heights. We can also deliver your new discount appliances to your home and have your old ones hauled away. We offer a 90-day warranty and extended warranties are available. Financing is also available.